What Is the National Labor Relations Board Function? The National Labor Relations Board (NLRB) is a federal agency founded by Congress in 1935 to administer the National Labor Relations Act (NLRA). The NLRB safeguards employees' rights to organize and to decide whether or not to have unions serve as their bargaining representatives with their employers. The agency also acts to prevent and remedy unfair labor practices that are committed by private sector employers and unions. The NLRB protects the rights of most private-sector employees to join together, with or without a union, to improve their wages and working conditions. The NLRB also is tasked with defending the rights of employers in a fair and legal manner. However, since the members of the board are political appointees, some believe the interpretation of the NLRA reflects on the political party in power at the time of the decision. The NLRB is made up of a five-member board nominated by the president and confirmed by the Senate. It also employs 40 administrative law judges who help decide cases. The NLRB assists in labor relations in several specific ways. When private-sector employees need to hold elections to form or decertify unions, the NLRB can oversee the process. Additionally, the NLRB investigates charges, enforces orders, and helps negotiate settlements when necessary. The NLRA is the main law governing relationships between unions and private-sector employers. The act guarantees the right of employees to organize and bargain collectively with their employers. The act ensures that non-union employees and employees who join, support, or assist unions may not be discriminated against by their employers or by their unions. The NLRB also protects non-union groups of two or more employees who attempt, without a union, to bargain with their employer over wages, benefits, and working conditions. Employees who are not union members generally are considered at-will employees. Employers may terminate, demote, transfer, or promote at-will employees without oversight. Employees who believe that they were discriminated against or subjected to unfair labor practices should seek counsel. Employees, union representatives, and employers who believe that their rights under the NLRA have been violated may file charges of unfair labor practices at their nearest NLRB regional office. 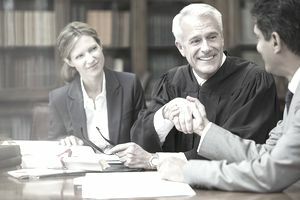 After the board investigates and makes a decision, the majority of parties voluntarily comply with the decisions of the board. If they do not, the agency's general counsel must seek enforcement in the U.S. Courts of Appeals. Parties to cases also may seek review of unfavorable decisions in the federal courts. In a 2001 decision, for example, the NLRB ruled that the employee teams at the Crown Cork & Seal plant could not be classified as labor organizations since they had supervisory authority to plan and implement their decisions An earlier, NLRB regional field office had found in favor of a complaining employee. A court decision found in favor of the company and the NLRB supported this finding.